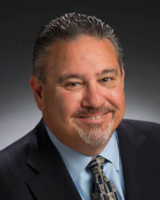 Ray Tromba joined Vintage Realty Company in August 2013 as General Manager of the commercial property management division and is responsible for overseeing more than one million square feet of office and retail space. Prior to joining Vintage, he most recently served as General Manager of the Louisiana Boardwalk for the past seven years and oversaw its rise to the region’s top tourist attraction. There he managed the day to day operation of 570,000 square feet of office and retail space on 56 acres of land, including oversight of all real estate development, leasing coordination, tenant construction, marketing and public relations, security, maintenance, landscaping and janitorial. In addition, he worked very closely with the Bossier City administration who are equity partners in the Louisiana Boardwalk. Prior to the Louisiana Boardwalk, Ray was the General Manager of Louisiana Downs Racetrack for 16 years overseeing its rise to national prominence in the racing and gaming industry along with being appointed by the Governor to the Louisiana State Racing Commission. Ray also serves on several boards including the Shreveport-Bossier Convention and Tourism commission and as past President of the Bossier Parish Community College Foundation and a current member. Ray received his Bachelor of Science degree from the University of Nebraska. He is married with one son.